Recently, GoCompare.com, a large car insurance comparison site that most of us see in TV adverts every day, was apparently hit by a penalty moving them from number 1 to page 7 for the search term “car insurance”. Google has yet to comment on the story but most search experts agree that the site appears to have been given a penalty for buying links, a tactic against the Google guidelines. Normally a site being penalised in Google isn’t major news (it happens every day) but in this case Hitwise has done some research into the effects of the penalty and offered some interesting statistics. Apparently before the sudden drop in rankings, 1 in 6 visitors to GoCompare.com found the site by searching for “car insurance”. Afterwards the traffic dropped 87%. Traffic to Confused.com has increased a staggering 77% in recent weeks as it gained the number 1 ranking. 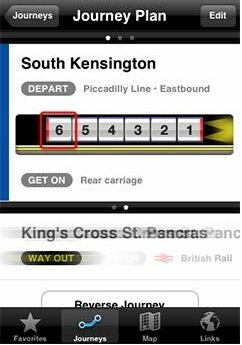 Tube Exits is an innovative and very handy new iPhone app that helps users save time on Tube journeys by helping them to select the best carriage to board sp that they can get off at their destination right by the platfom exit. Is online lead generation right for your brand? An increasing number of brands are starting to take Online Lead Generation (OLG) seriously and making it a central part of their online customer acquisition strategy and it’s not hard to see why. If you sell widgets and you can capture leads where the consumers are all interested in buying widgets then you can put a process in place to turn those interested customers into sales and therefore revenue. Simple right? For many brands it is pretty simple but before you decide to allocate thousands of pounds to a lead gen campaign it pays to take a step back and ask yourself a few questions to work out whether OLG is right for your brand.